Although Vernon Miller is now recognized for his great accomplishments in Canadian comics, his beginnings were much less auspicious. He is well known in the industry for having created one of the first Canadian comics publishing companies and subsequently the first Canadian superhero. Miller was born in Winnipeg in February 1912 to Gerald and Ethel Miller. He was the second born in a family of three boys and one girl. Mr. Miller supported the family by working as a real estate agent in Vancouver, while Mrs. Miller stayed at home with the children. Vernon spent the better part of his childhood in Winnipeg before moving to Vancouver in his early teens. It wasn’t much later that he began his career as an illustrator in local newspapers such as the Vancouver Sun and The Province. He did so until the early part of WWII when the Canadian government introduced legislation that lead to dramatic changes in print culture in Canada. In December 1940, the War Exchange Conservation Act prohibited most American periodical publications from being sold in Canada. Miller, seeing the opportunity to capitalize on this market, decided to take advantage of the now vacant industry in Canada. In 1941, with Harry Smith, he co-founded Maple Leaf Publishing, one of the first four original publishers of comics in Canada. The first issue released by the company, Better Comics, appeared on newsstands in the spring of that year, beaten only by Anglo American’s oversized melange of reprints and original material. Alternatively, Better Comics was published in the traditional size and format and featured all original material. Among the stories was the first appearance of Iron Man, better known as the first Canadian superhero. So not only is Miller responsible for creating the one of the first Canadian comics publishers and comic book, but also creating and executing Canada’s first superhero. The premise of Iron Man is that, at the beck and call of the two children Jean and Ted, and the Major, Iron Man would depart from the depths of his watery home in the South Seas to fight the Axis or any other number of topical villains. Ignoring the discordance between his name and home, Iron Man was of a race of evolved, super powered humans that were prematurely destroyed by an earthquake. He is well known for mourning the loss of his people, which was only broken by his trips to the surface. 1941 was a busy year for Miller. During this time he also married his wife Lillian. They later had two children together named Richard and Karen. Maple Leaf Publishing expanded to four titles including Better, Lucky, Rocket and Bing Bang comics shortly after the success of Better. They expanded to include other great heroes and characters such as Black Wing, Senorita Marquita, Brok Windsor, Derry Dreamer, Bill Speed, Callahan, the Adventures of Peter and Peggy, Honourable Freddy and Circus Girl. Directly, Miller worked on several of the books in all aspects as both creator and producer, but as his staff of artists grew he began to do more writing and editing rolls, working on such titles as Danny and his Magic Ring, Mr. E and Tiger Tex among others. During Canada’s golden age period from 1941 to roughly 1946, Maple Leaf publishing was not only a prolific but also quality comics publishing company. They produced several distinctly Canadian pieces with many successful artists on staff such as Bert Bushell, Jon Stables, Ernest Walker, Shirley “Ley” Fortune and Ted Watson. Unfortunately, in the spring of 1946, as the ban was lifted, Maple Leaf was forced to cease publishing as American comics again flooded the market. This was not the end of Miller’s illustrating career, though. He continued to do work for newspapers and periodicals including the popular Canadian Boy Magazine in the 1960s. Vernon Miller passed away in 1974 at the age of 62 years old. You can read one of his Iron Man stories here. For more about Maple Leaf Publishing and comics here. Long Bio Prepared for the CCBCAA by Rachel Richey. 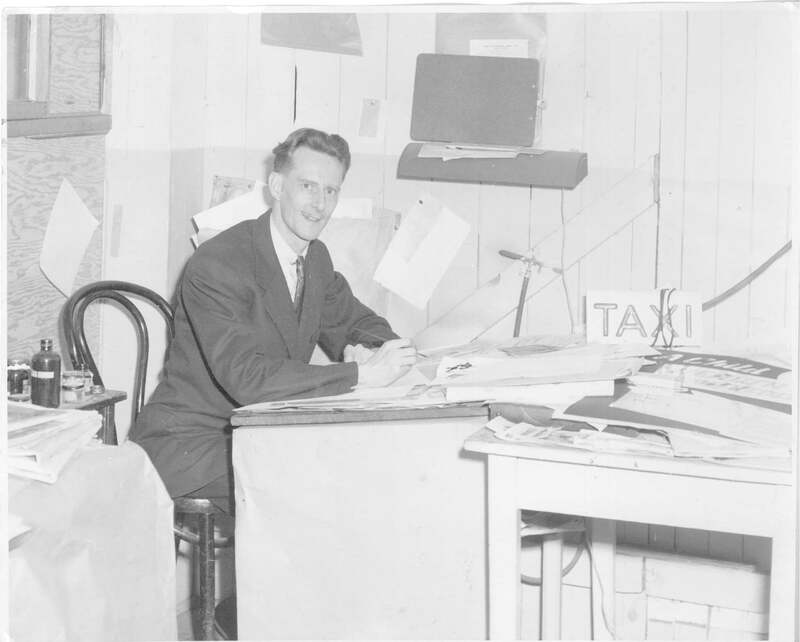 Co-founder of British Columbia’s Maple Leaf Publishing in 1941, one of the four principal publishers of comic books in Canada during World War 2 and the years shortly after under the protection of the War Exchange Conservation Act. 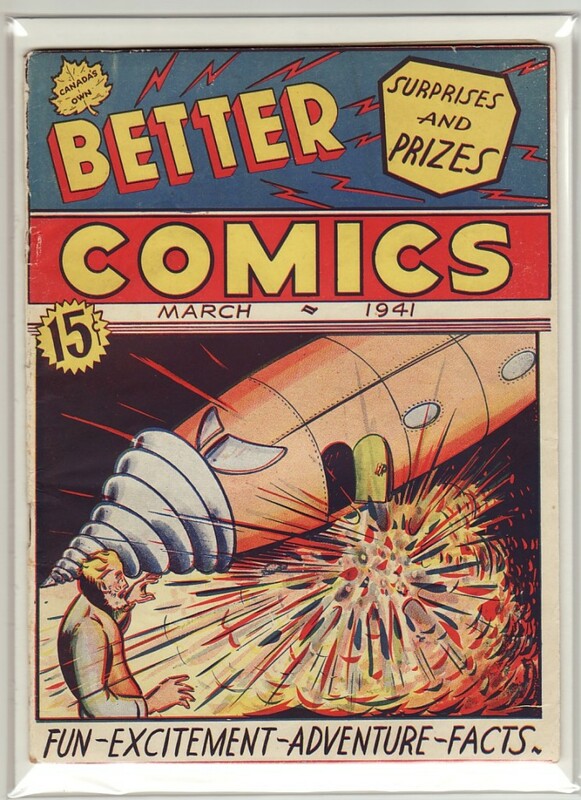 Maple Leaf’s first foray into publishing, Better Comics #1 (March 1941) is generally agreed to be the first original Canadian comic book because it featured new material almost exclusively created by Miller. Better Comics #1 was also the debut of Miller’s original superhero, the first Canadian superhero — The Iron Man (in full colour! Predating Marvel’s similarly named character by 22 years). Better Comics also included Earth Torpedo, Tiger Tex the Cowboy Detective, Roaring Rails, and The Hidden Passage with illustrator F.P. Thursby. Miller, who addressed his young readers as “Uncle Verne”, also produced Mystery Mountain for Rocket Comics. Miller went on to a career as a cartoonist for Vancouver newspapers, and also did illustrations for Canadian Boy Magazine in the 1960s.